It's election night here in the U.S., and what better way to pass the time than to write about video games? Don't worry, I already did my civic duty, so no one can blame Halo for preventing me from voting. 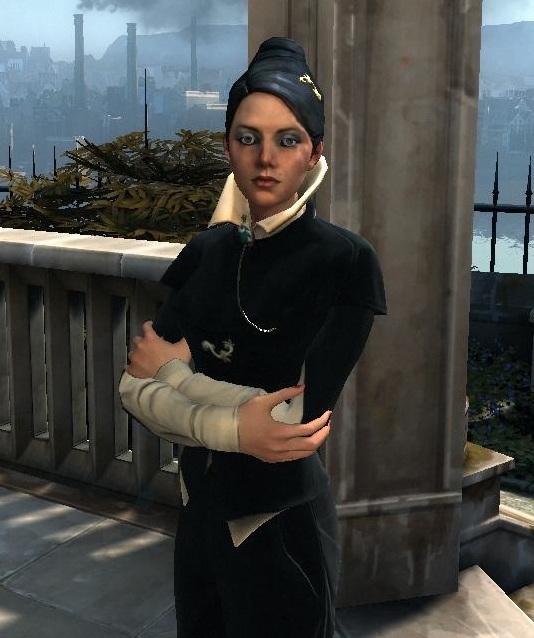 Maybe I've just been swept up by the political season, but I found myself thinking about Dishonored's fictional government. It's hard not be grossed at least a little grossed out by election season. Months (more like years!) of constant bickering, selective fact checking, and baseless predictions is tiresome. Additionally, because most of my adult life has been dedicated by studying my country's history (academia is a weird place), I have a hard time buying into the triumphant narrative that gets trotted out every few years. Without launching into a huge discussion on race, gender, and socio-economics, there are plenty of smudges on America's record and plenty of things the country needs to work on. However, there is at least one thing that makes me proud of my country: the U.S. does not have, and has never had, established royalty. This brings me back to Dishonored. Maybe I'm more patriotic than I thought, but I couldn't help be feel a little depressed that Dishonored's plot revolved around the attempt to reinstall a monarch. Democracy isn't perfect, but it at least opens the door for common folks to have a say in who rules them. As Corvo, not only was I responsible for killing more than my fair share of innocent bystanders and guards who were just doing their jobs, I was also ensuring that they would remain the subjects of an autocrat. An evil vizier who harbors genocidal intentions towards poor people murders his way into authoritarian power. The Abbey of the Everyman appears to be a government-backed church that functions to suppress the poor, eradicate traditional beliefs, and squash dissent with an elite, ecclesiastical army. The wealthy upper class are able to hire police and government officials as private security for lavish parties while the poor people starve and die in the city's alleys. Juxtaposed against these elements, a theoretically benevolent Empress is the least of all evils I suppose. The Empress' daughter seemed like a nice girl, but my quest to return her to the throne meant that I had to live among the common folk. I saw their neighborhoods at street level and watched them go about their day to day lives. With a little bit of magical help, I listened to their inner thoughts and learned about their backgrounds. The more I learned, the more I doubted that Emily understood or deserved to rule them. But I didn't have any choice in the matter. I was playing for the empire and, try as I might, I couldn't stab my way out of a monarchy. Democracy will have to wait for DLC. Good question. There are so few games that address politics at all, partially because so many of them are from a first-person perspective without a good angle into systems of politics. I'd say Fate of the World does a pretty good job of international politics, but it's easier since it's a strategy game. In fact, there are quite a few politically minded strategy games that do a decent job of talking about politics. You could maybe count the Assassin's Creed series as well. But The Wire it isn't. The weird thing was, it wasn't so much a question of whether it was a good representation of politics so much as whether it was a mirror on my own latent political beliefs. I'm not the most "rah, rah, go 'Merica" kind of guy, so the twinge of patriotism is quite strange. If world of Dishonored is as influenced by English history as it seems then it is actually closer to the American system than it might at first appear. The Pendleton's are described as being Members of Parliament, given their social standing I would assume they were members of what in England is the House of Lords. This is the Upper House of our Parliment and the equivalent of the Senate. It's not unreasonable to assume that there is also a Lower House, a House of Commons, which would be the equivalent of Congress. In England the Upper House is appointed and often serves based on family heritage and title, while the Lower House is voted upon approximately every five years. In contemporary politics the Head of State may be Royalty or a President (As in Russia or France) , is largely symbolic (As our own Queen is) and the real power would preside with the Prime Minister. If that is the case then the Empress is the nominal "Head of State" and there would also conceivable be a Prime Minister who was the leader of her Cabinet and head of the Civil Service. In that sense then returning the Empress to power would not be substantially dissimilar to returning a President to power. The absolute power of the Empress is implied by the fervour by which others attempt to usurp that position but it could be argued, given the way the game is focused around Emily that the role of Empress is still largely symbolic. Monarchies are far from ideal political models however a case has often been made that Queen Victoria, whom the Empress reminded me of quite strongly, was influential in raising the living and working standards of people across England. Whether that is a claim that holds true under scrutiny is something best left to those with a greater understanding of English history than I. From my playing of Assassin's Creed I wouldn't say it deals with politics as much as perhaps even Dragon Age 2, which is hardly a bastion of it but DA2 kind of works for this given it deals with pretty much 2 issues, Mages and the Qunari, making it easy to explore those political issues. Mmm, fate of the world was interesting in that sense, but I think it was far too abstracted to really have the same kind of impact. I didn't even consider it until you mentioned it. I'm going to have to scour my collection on this though, I'm curious and I'm sure I'm missing something that is hugely obvious. Good call on the Queen Victoria allusion. Especially the way I played, the empress, Emily in particular, was very much a moral beacon for the common folks.